Unify in Order to Evolve. Attracting Synchronicity. Power of Navigation. Perpetual 13-day Wavespell. Last appearance from 31 March until 12 April 2019. All Dreamspell codes displayed by day are based on the original work Dreamspell (1990-1991), designed and presented by José and Lloydine Argüelles, otherwise known as Valum Votan & Bolon Ik. The wavespell overview, prophetic analysis, artwork and organisation of the codes are all done by Tortuga 13:20 Communications. 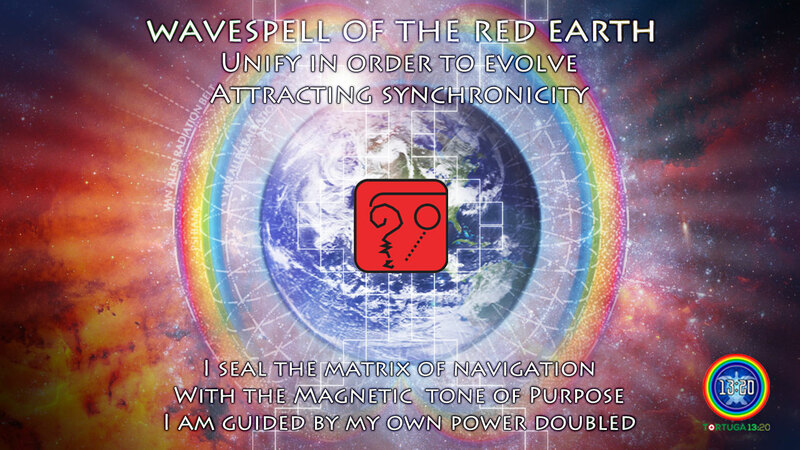 The Red Earth Wavespell is the 13th wavespell of the Dreamspell Journey. This wavespell opens the Yellow Southern Castle of Giving, which is the fourth Castle of the Dreamspell Count. 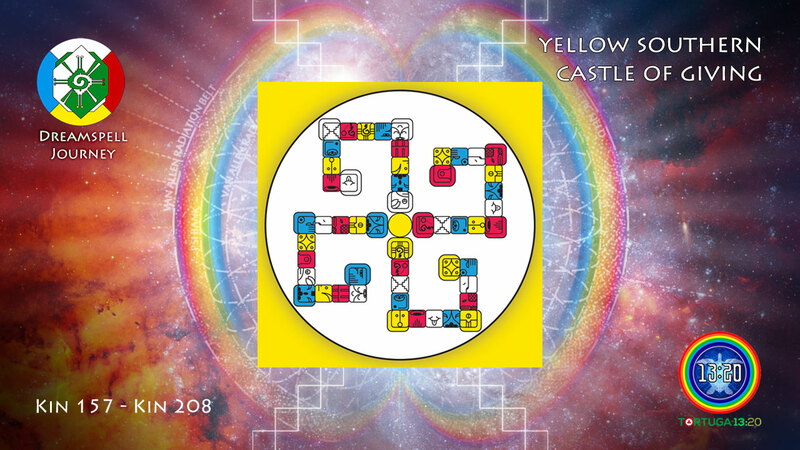 The Yellow Castle represents the Court of Intelligence and it covers the fourth group of 4 Wavespells (Earth, Dog, Night, Warrior) = 4×13 = 52 Days x 5 = 260-day Tzolkin. The Yellow Castle of Giving goes from Kin 157 until Kin 208. Through Giving, the planetary kin attain the Power of Ascending. Original Mayan glyph of Kab’an. Source: Arqueología Mexicana. In the Dreamspell transcreation, the solar seal of “Earth” is inspired on the Mayan glyph of “Kab’an”, which exactly signifies “Earth” and it also represents “Thought, Knowledge, Science”. In the Dreamspell, the Earth is the Solar Seal number 17 and it is associated with colour “Red”, being part of the “Red Root Race” of the “Initiators”. In the same way, the Red Earth has the action to “Evolve”, the essence of “Synchronicity” and the “Power of Navigation”. All of these attributes relate to the original Maya meaning of Kab’an because “knowledge and science” are essential to human evolution. The visionary 13:20 Dreamspell Tzolkin is also an example of the spiritual science of synchronicity. The purpose of this wavespell (Magnetic Earth, Kin 157) is also the purpose of the current Year of the Cosmic Moon: “Unify in Order to Evolve. Attracting Synchronicity”. Exactly, the Cosmic Moon is the last Kin 169 (13×13) of the Earth Wavespell. Therefore, the 13-day Earth Wavespell is also the planetary service wavespell of the 13 moons of the current Cosmic Moon Year. The Red Earth Wavespell is also directly related to the New Earth dimensional shift of 2012-2013. On the Maya RealTime side, it contains the days of 3 Kawak (3 Storm, Kin 159) and 4 Ajaw (4 Sun, Kin 160) which represent the Maya 3 Stones of Creation (3 Kawak), and the conclusion of the Maya 13th Baktun Cycle (21 December 2012, 4 Ajaw). On the Galactic DreamTime side, this wavespell contains the Kin 163 (Resonant Night) of the historical Day Out of Time 2013 (25 July), the time tunnel towards the Kin 164 of the “Galactic Seed Synchronisation” (26 July 2013). Down below, the Galactic Maya Prophetic Perspective by Tortuga 13:20, followed by the Original Affirmations and Codes of the Red Earth Wavespell by Valum Votan and Bolon Ik, the authors in Eternity. In Lak’ech.